I am Michelle Elman. I live in London and am 23 years old. I am a Body Confidence Coach trained in Hypnotherapy, Time Line Therapy, Neurolingustic Programming and NLP Coaching. I decided to embrace my body when I realised I had been spending my whole life trying to change it. I had wasted so much time and energy on trying to be a different size through diets, that I had sacrificed so much of my life and opportunities to have fun because I was so concerned about what I looked like. I decided to start accepting my body how it was, just to try something different and then I realised how liberating it was. Yes, especially around my scars. I have had 15 surgeries and the bulk of my scars were created when I was young so my body has always been different from the norm and that was tough as a child, and especially as a teenager. Growing up, all you want to do is fit in and be normal and I was never given that option. I thought the solution was to hide my scars and never talk about it but it was actually the exact opposite that helped. Starting my campaign Scarred Not Scared and wearing a bikini for the first time was the most empowering thing I could ever have done. I think it's great. It shows young girls that every body is capable of being fashionable and it shows more than one type of beauty. I would prefer we stopped segmenting women into straight size and plus size though - I don't understand the need for the distinction. ASOS Curve! I don't know how I dressed before it because in shops it's so hard to find my size. My stomach because my scars make it unique. I have the only stomach in the world that looks like mine. I grew up hating this part of me and I think now, because I love it, I love it the most because I worked the hardest to love it. To immerse herself in body positivity online. Make sure your social media and your newsfeeds are body positive, follow people you make you feel better about yourself and your body. Anyone who tells you that you need to change your body in order to love it, doesn't deserve to be on your newsfeed. It's a shame for anyone to grow old without realising the strength and beauty your body is capable of. By listening to it and making the most of it by making the most of my time on this earth. 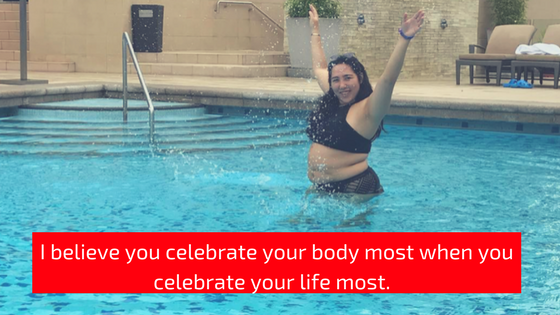 I believe you celebrate your body most when you celebrate your life most. Use your body as the vehicle it was designed to be and be grateful to your body for keeping you around long enough to enjoy your life. 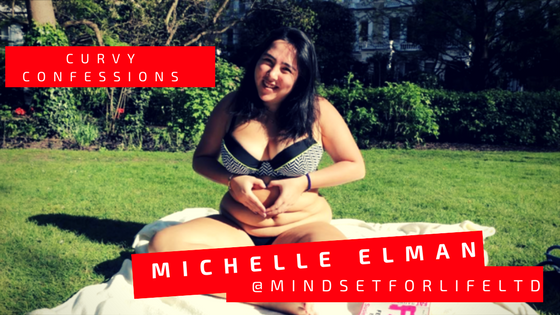 Much love to Michelle for sharing her insight and encouragement for body positivity. Make sure you follow Michelle on her platforms below!